IONDESIGN GmbH Berlin completed the new offices for international law firm Morrison & Foerster, located in Berlin, Germany. A law firm is not an advertising agency – Business premises are both external image of a company and expression of the self-image. When designing a law firm, the requirements are different than when designing an advertising agency or an IT startup. Therefore, it is important to first get to know the working methods and the clients in order to optimize the interior design individually. A responsible approach to design does not mean tearing down walls randomly and forcing open space office structures, as is often the case. Although it is clearly noticeable that even conservative work environments are becoming more open and subject to change, a law firm is not a co-working space. Thus, the precise built-in cabinets made of solid oak convey reliability, tables designed especially for the law firm give every rooms an individual character. Light-dark contrasts as well as a neon light object in the reception area of the law firm create dramatic effects. Each room is an independent character –At the Berlin office of the international law firm Morrison & Foerster, IONDESIGN develops conference rooms, a cafeteria, hallways, guest offices, tea kitchens and sanitary facilities. Each of the rooms is given its own character, so that the choice of a meeting room depends not only on the size of the room but also on its individual attributes. The coloring of the table linoleum and the shape of the table tops increase the distinctiveness of the rooms. As a continuous design element is a horizontal band of oak cabinets through all rooms. The precise built-ins with a permeable lamellar structure hide radiators, technical components and storage space. Modular conference table system –IONDESIGN created a modular table system that can be adapted to different room sizes. More than 30 people can sit at the table in the largest conference room. The same principle forms a conference table for four persons in the smallest conference room. The linoleum covered tabletops are carried by filigree table racks. The fine lines of the black table racks made of tubular steel form polygonal shapes. They enclose reflecting cable ducts, which are placed directly on the floor tanks. The table system developed by IONDESIGN for this project hides cables and conference technology. Inside the channels, cables and connections are routed invisibly to the table surface. The possibility of lifting the entire module upwards through the tabletop and to place it on the table surface allows uncomplicated access to the technical components at all times. The reflective surface of the cable ducts almost makes them invisible. The combination of the tabletop and metal table racks opens up a wide range in the configuration of tables. This principle is used to create an individual desk, a round and a polygonal conference table. Dramatic contrasts –In the cafeteria, the design studio relies on dramatic contrasts of deep blue and bright white. The bespoke built-in units stand out clearly from the dark tones of the walls and the floor. Reflective pendant lights above the white tables and surfaces enhance the light-dark contrast and create focal points in the room. The lighting deliberately sets accents on communication areas. 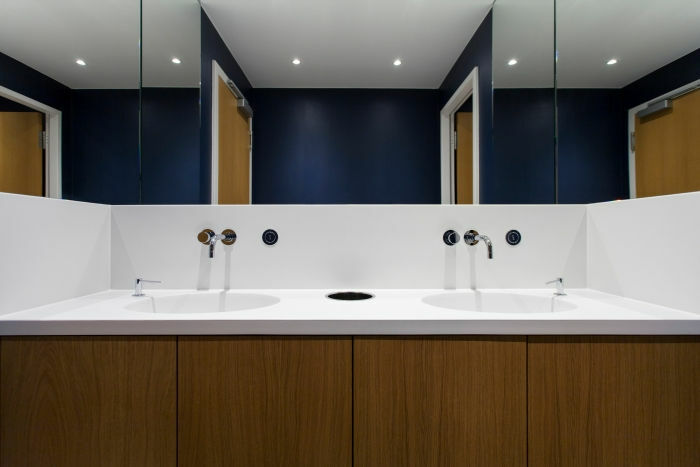 Strong contrasts are also used in the sanitary rooms, where the white sanitary objects stand out clearly from the deep blue walls and dark stone floors. A neon object is the new the focal point in the reception area. Through the use of reflective and transparent glass surfaces, the blue neon lettering “Morrison Foerster” multiplies into an optically generated depth.